Today, the agreement made by Kolej Yayasan Pahang and International University of Malaya-Wales on 15th June 2016 is now realized. KYP-IUMW Master in Business Administration program was officially launched on 23rd September 2017 while the registration was conducted on 15th September 2017 at KYP Taman Gelora Campus. The KYP-IUMW MBA program soft launch was officiated by KYP Managing Director, YH Dato’ Norhishamuddin Yaacob. The brief yet meaningful ceremony was attended by the delegates from IUMW, namely Dr Ahmad Sabri Bin Yusuff, Datin Adib Mulyani, Puan Rosmaiza and two executives. Apart from that, the ceremony was also witnessed by KYP Management committee as well as twenty four (24) KYP-IUMW MBA students. The two-year MBA program was participated by working adults from various organizations. The college was honored to receive YDH Orang Kaya Indera Pahlawan Dato’ Sri Wan Hj. Abdul Wahid Bin Hj. Wan Hassan as one of the students. “KYP and IUMW are working very closely to ensure the quality of our graduates. We are monitored by Quality Assurance Agency (QAA) of Higher Education in the UK as well as Malaysian Qualifications Agency (MQA). Therefore, the standard of our education are parallel with them. Our future graduates will become the global citizens, we will work together to ensure they will excel beyond global. The journey is not easy but achievable. Welcome new students of KYP-IUMW MBA program!” said Dr. Ahmad Sabri Bin Yusuff, IUMW Director of Strategic & Institutional Partnerships in his speech. Meanwhile, KYP Managing Director in his remark was emphasizing on the college capability in providing high standard teaching and learning facilities as well as quality services. “Soon, KYP will be known as University College of Yayasan Pahang (UCYP). Our new academic building, that can accommodate almost 2000 students at a time, will also be completed soon. All degree and diploma programs will be conducted there. Meanwhile, Taman Gelora Campus will become the campus for franchise programs. In addition to that, KYP strongly believes on quality. To have quality, we need diversity. Diversity will lead to that quality in which it promotes profitability. 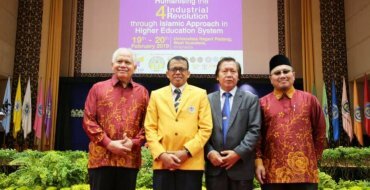 That is the mission that everybody needs to work on,” said Dato’ Norhishamuddin Yaacob.